Mansfield, 3 @ Franklin, 6 – Final – Click here for a recap of this game. King Philip, 6 @ Taunton, 8 – Final – Taunton saw its 4-0 lead disappear when King Philip plated five runs in the fourth inning and went up 6-4 with a single run in the fifth. 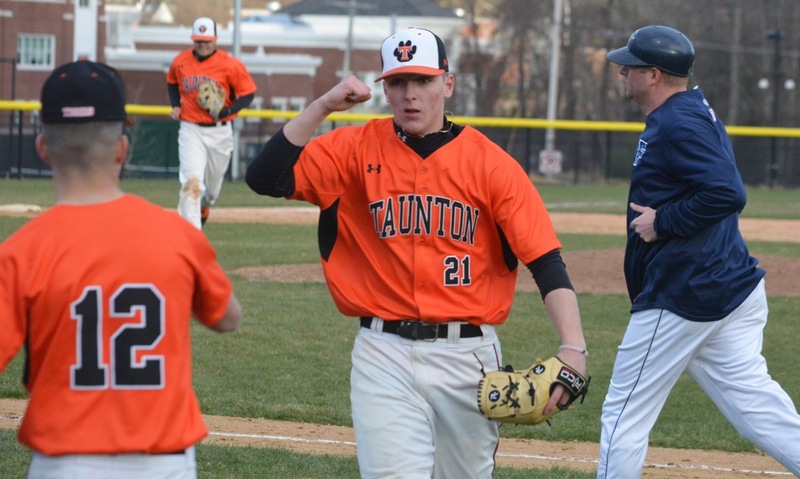 But the Tigers struck back with a run in the bottom of the fifth and then junior Christian Simoes had a three-run double in the bottom of the sixth to put Taunton back ahead. 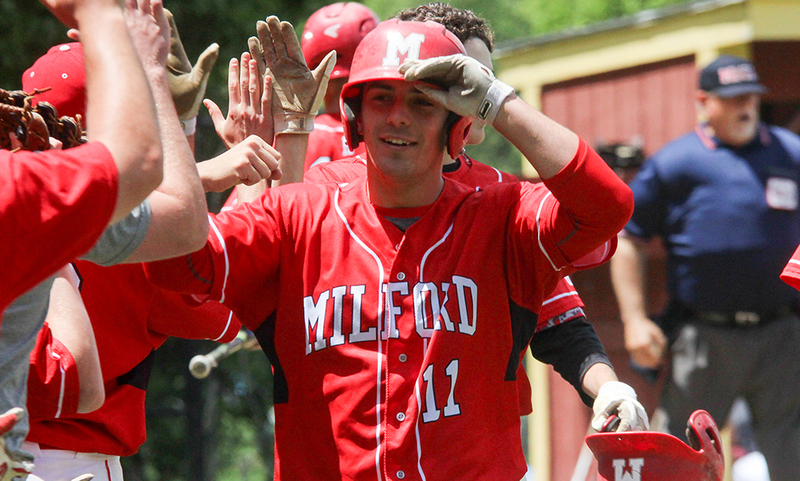 Tyler Medeiros also had an RBI for the Tigers, Matt Machado had two hits, Jacob Crawford reached base three times – two hits and a walk, and William DaRosa delivered a pinch hit RBI double. Sophomore Griffin Tomaszycki pitched a scoreless sixth inning to earn the win and Danny Keogh pitched a scoreless seventh inning for the save. Franklin, 4 @ King Philip, 16 – Final (6 inn.) – King Philip junior Jess Bonner connected for a pair of home runs and knocked in a total of five runs as KP put up its second largest offensive output of the season. Meg Gorman added four hits, including three doubles and Hailey McCasland, Nicole Carter, Brooke Taute and Sydney Phillips each had two hits. Jenn Hutnyan earned the win, striking out 10. Franklin sophomore Ally Shea hit her first home run and finished with three RBI while freshman Anna Balkus had two hits. Taunton, 8 @ Oliver Ames, 1 – Final – Taunton’s Jaime Brown (two RBI) and MacKenzie Handrahan each had two hits, while Kya Enos drove in a pair of runs with a base hit and suicide squeeze. Eighth graders Hannah Aldrich and McKenzie McAloon both had a base hit and RBI, while freshman Jaylin Couto had an RBI suicide squeeze. Courtney Fisher earned the win, allowing an unearned run in six innings of work on four hits. Couto pitched a scoreless seventh inning. Canton, 3 @ Oliver Ames, 2 – Final – In a back and forth contest, Canton came out on top by scoring the game-winner with less than a minute to play. Goals from OA’s Eric LeBlanc and Canton’s Nick Allen sent the game into halftime tied 1-1. Griffin Roach put Canton ahead 2-1 with 9:14 left in the fourth but LeBlanc netted his second, tying the game with just 1:40 to play. Matt Martin was the hero for the Bulldogs, netting the winner with 26 seconds to play. Canton freshman Jack Connolly made 11 saves in the win. Franklin, 19 @ Taunton, 4 – Final – Mairead Gogeun paced the Panthers’ offense with four goals and one assist and Shannon D’Arcangelo and Grace Platner each found the back of net once as Franklin clinched the outright Kelley-Rex title for the fifth straight season. FHS head coach Kristin Igoe Guarino said Kate Morse and Molly O’Reilly both played well defensively in the win. Abbey Kingman scored a pair of goals for the Tigers and Lorna Li came up with 17 saves in the loss. Franklin, 4 @ Foxboro, 1 – Final – Franklin earned two wins in singles play and two more in doubles to defeat Foxboro on the road. Eli Brooks won 6-1, 1-6, 6-2 at second singles and Rohan Herur secured a 6-1, 6-1 win at third singles. The team of James Johnston and Derek Wu won 6-3, 5-7, 6-2 at first doubles and Tyler DiPalma and Rahul Hosdurg won 6-4, 6-4 at second doubles. King Philip, 2 @ Bishop Feehan, 3 – Final – King Philip earned a pair of singles wins but ultimately fell to Feehan. Cole Ginter won 2-6, 6-4, 10-8 at singles and Martin Matous recorded a 6-3, 6-2 win at third singles. Attleboro @ Oliver Ames – Postponed to Wednesday, 5/24 at 3:45. Foxboro, 4 @ Franklin, 1 – Final – Foxboro swept doubles play and took two wins in singles action to defeat Franklin. Lexi Nelson (second singles) and Julia Muise (third singles) each won 6-0, 6-0. The team of Kayla Prag and Olivia Dantona won 6-1, 6-0 at first doubles and Morgan Krockta and Kendall Milender prevailed with a 6-4, 6-3 win at second doubles. Franklin’s Hannah Sweeney won 2-6, 6-0, 6-4 at first singles. Taunton, 3 vs. New Bedford, 1 – Final – Taunton jumped out to a 2-0 lead over New Bedford and held on for a 3-1 victory, 25-19, 25-22, 15-25, 25-22. THS coach Toby Chaperon said Mike Fernandez, David Fusiecki, Nick Sorm and Nate Grant each played great all around games, combining for 37 digs, 20 assists, 15 kills, four blocks and three aces.